As I am a professional developer that works in Visual Studio all day, I guess I'm a bit spoiled by IDE's with a good feature set. Specifically, I missed syntax checking and code completion (intellisense). Because of this, I looked around for a bit and finally found a very good solution. It adds both missing features - and after configuration - full API intellisense. As such, I figured I would share my findings with other developers. After IntelliJ is installed, you then need to add LUA support, and luckly someone already made a plugin for this! To install it, open IntelliJ and go to File->Settings->Plugins, click on 'Browse Repositories', search for 'Lua', and click 'Install'. If you want more information about the plugin itself, you can find it here: https://bitbucket.org/sylvanaar2/lua-for-idea/wiki/Home. These lua files were generated with a set of powershell scripts I created. With those, I copy/paste the api information off the esoui wiki pages into a text document, save the document, then run the powershell scripts. For those interested in those scripts, please PM me. Create a new project, select 'Lua' as your framework, press 'configure', choose 'LuaJ' then press the '+' button on the right. In the dialog that pops up, select the folder you extracted earlier. Now when you make new projects just select the 'LuaJ' target, and you will have intellisense for the ESO API and your own code! Last edited by Tinuviel : 04/11/14 at 12:41 PM. Reason: I was super tired when I wrote this, so I just cleaned up a lot of grammar. Corrected your typo in the title (in sylv's name). It's what the game uses. As you can see it has an IDE with intelliSense, etc. One could probably get a basic license, maybe an "indie" license, or something for cheap. Does the syntax checker from IntelliJ just mark lexical errors or grammatical errors, too? Just looked, and it doesn't. Thank you for you hard work - is it possible to implement your script in Eclipse too? @Iyanga: What IDE do you use? I work all day in Visual Studio. I should probably use an IDE for Lua too, eh? I've done everything up to this point in Notepad++. Nobody use good old Notepad anymore? Gonna test this with VS. Hopefully it works in 2010. I work in Visual Studio all day as well. I'm a professional .NET developer for trade. I use Notepad++ all the time too, but generally for lighter things. A lot of the time it's for manual .csproj / .vbproj editing, one-off quick fixes, viewing XML / nuspec / build logs, etc. When I'm making something more meaty, I like more help. Last edited by Tinuviel : 04/25/14 at 07:48 PM. I found this by looking at WoW solutions and altering them to fit ESO. I would search for that, and look into modifying it to work with Eclipse. I did see some Eclipse plugin somewhere, but I have used Eclypse in the past and there are a bunch of small differences between the Visual Studio methodology that have always irritated me, so I didn't pursue that route. ...I've done everything up to this point in Notepad++. Nice find! Whilst Notepad++ is pretty good, I've been using Ultra Edit for around 15 years. I've just used gvim for ridiculously large files. 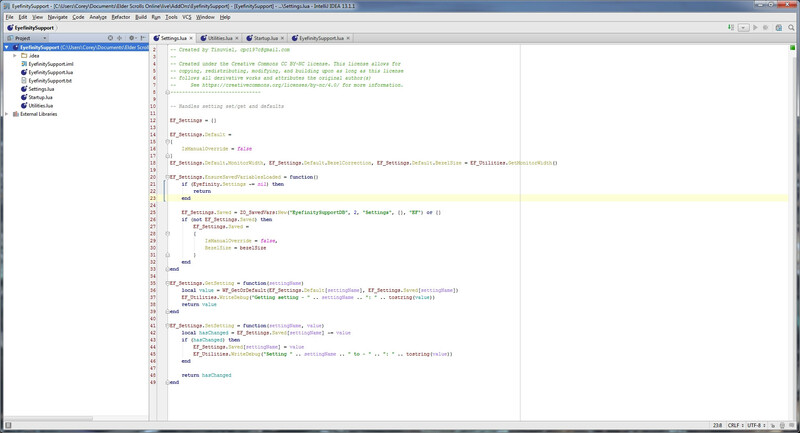 the code copletion feature in IntelliJ looks great. 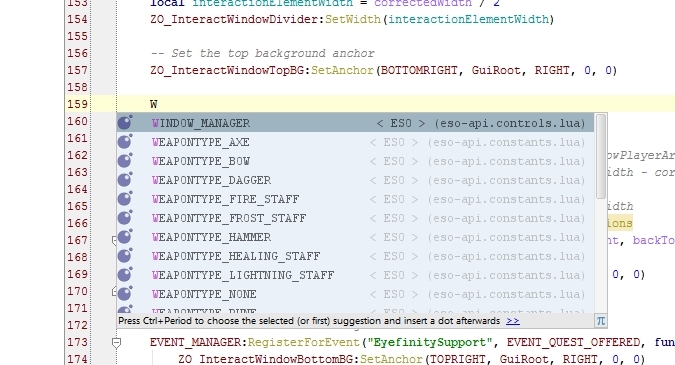 I'm using LuaEdit but I don't know if it's possible to add the eso api to thier code copletion mechanism.